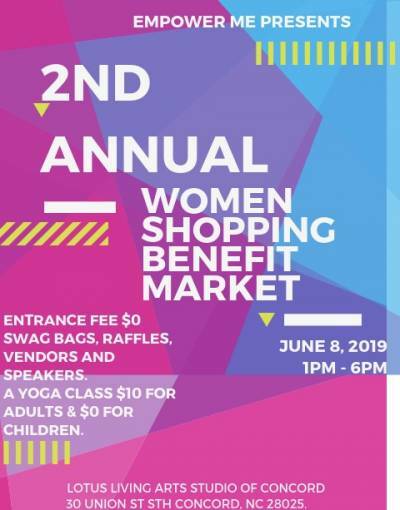 You are invited to join us on Sat, June 8th from 1 pm to 6 pm for the 2nd Annual women benefit shopping market event, presented by the Empower Me group and benefiting the women and children of the Congo. This event is to celebrate all the women and children in the world. The event includes a yoga class for adults and children, local vendors and Author/ Life Coach Monique Callahan with her book Title Dying to be Thin while trying to Fit in. There will be handmade artisans, jewelry, beauty, wellness services to help you find a perfect father’s day gift. We hope you can join us for this fun Saturday to support local businesses and a great cause. Thank you in advance for your support and generosity.